Some held signs that read, "Goodnight alt-right," "Fascists not welcome. No to white supremacy," "Stop racist police" and "No hate! No KKK! No Nazis in the USA!" 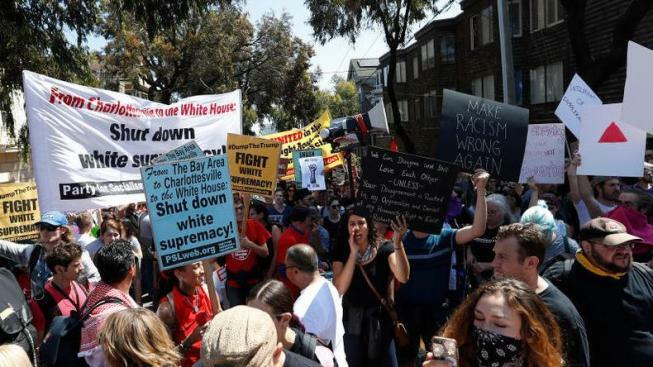 A planned right wing rally was cancelled, but that didn't stop some from filling San Francisco streets to denounce hate, white supremacy and fascism. Sergio Quintana reports. A planned right-wing rally in the shadow of the Golden Gate Bridge that was downgraded to a news conference at Alamo Square Park fizzled further on Saturday, after San Francisco police swarmed the park and city workers erected a fence around it. 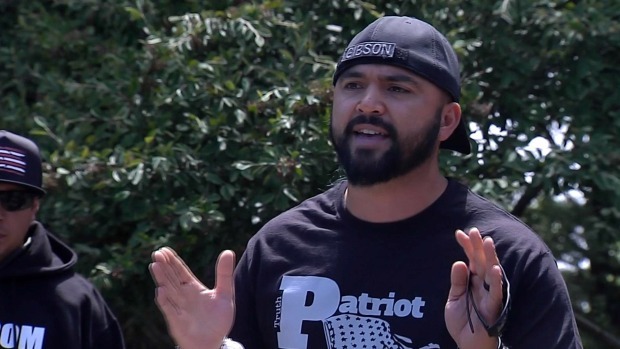 Joey Gibson, an organizer for the group Patriot Prayer, took to Facebook Saturday, issuing an apology to people who shelled out money on plane and train tickets to the Bay Area as well as those who drove 16 hours to get here. "Today's been a crazy day," he said on Facebook Live. "Basically everywhere we go, the police, the city, they want to shut it down." Gibson indicated that he planned to do an indoor news conference at 2 p.m., but left the exact location unknown. He also said he would "pop up at random spots in the city to talk with any citizens of SF." A planned right-wing rally in the shadow of the Golden Gate Bridge that was downgraded to a news conference at Alamo Square Park fizzled further on Saturday, after San Francisco police swarmed the park and city workers erected a fence around it. Sergio Quintana and Christie Smith report. He eventually spoke in Pacifica with a handful of supporters, but was forced to end the news conference abruptly upon hearing that members of the anti-fascist movement were heading to the Peninsula. 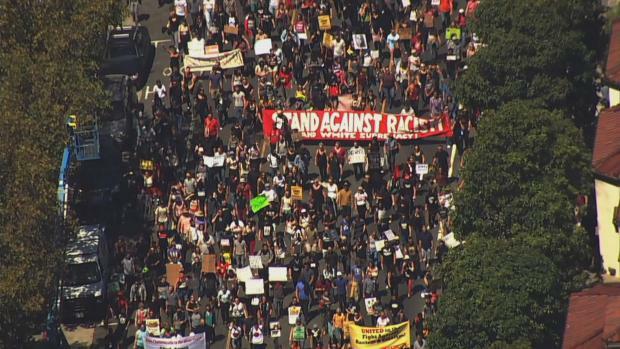 San Francisco leaders and police had repeatedly voiced concerns that Patriot Prayer would draw angry counter-protesters and spark violence in the area known as the cradle of the free speech movement. Marches and rallies did indeed crop up across the city by the bay Saturday, but only one person was arrested for public intoxication and no injuries were reported, San Francisco Police Chief William "Bill" Scott said during a news conference alongside Mayor Ed Lee, who said he was "extremely proud" of those who peacefully took to the streets and spoke out against hate. "They marched all throughout the city with that basic theme that we're going to resist hate, we're going to make sure our city is safe," Lee said. "They marched for each other. They yelled and screamed for each other. They made sure that the themes of love and compassion dominated over hate speech and inciting violence." Joey Gibson, an organizer for the group Patriot Prayer, addressed the media after canceling a planned rally at Crissy Field. Thom Jensen reports. Gibson vehemently denied his group was looking for trouble and declared that Patriot Prayer had been unfairly labeled as being racist. In fact, he said, its members had received anonymous threats on social media and feared civic leaders and law enforcement officials would fail to protect them. "My hope is to be able to talk to normal citizens without all the extremists," Gibson, who identifies as Japanese American, said at the news conference. "We have to wake up," Patriot Prayer supporter Will Johnson said. "This fighting is not going to get us anywhere. We have bigger issues coming to America, and we're fighting for over nothing." Alamo Square Park was originally meant to be the site of a Saturday news conference by right-wing group, Patriot Prayer, but the San Francisco neighborhood was instead inundated with hundreds of counter-protesters. 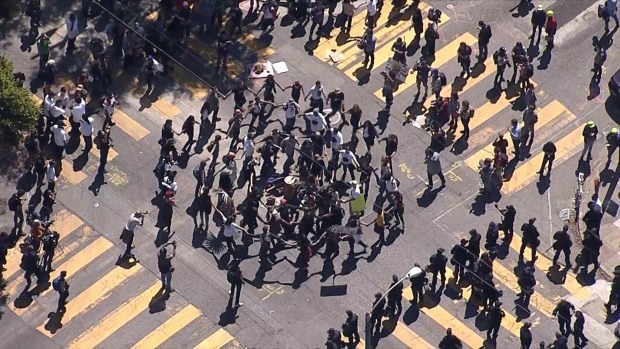 The pivots by the group didn't deter more than 1,000 left-wing counter-protesters from descending on Alamo Square park, where they suspected right-wing supporters still might show up. The neighborhood was inundated with counter-protesters whose resounding message could be summed up in one sign: "Goodnight alt-right." Police closed the park early in the day and looked on in riot gear as the demonstrators gathered around its perimeter waving signs condemning white supremacists and chanting, "Whose streets? Our streets!" Some held signs that read, "Fascists not welcome. No to white supremacy," "Stop racist police" and "No hate! No KKK! No Nazis in the USA!" NBC Bay Area's SkyRanger captured footage of people, with what appeared to be feather headdresses, dancing in the streets, while others seemed to take inspiration from the nursery rhyme, "Ring a Ring o' Roses," and moved around in a circle before marching to Mission and 24th streets. En route, they even conducted a "die-in" in the middle of the street. A crowd, also in the hundreds, packed a "Come Together Rally" at Harvey Milk Plaza in the Castro, under a slew of rainbow flags that flapped in the wind. "The outpouring of love, you could almost feel it physically," San Francisco Supervisor Jeff Sheehy said. "In the Castro, I could. It was like this wave just hit me of love, not hate. That's what San Francisco is all about." 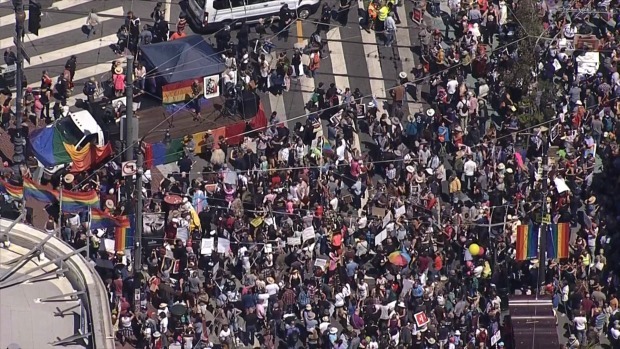 Those in the Castro joined others from the Dolores Park area to march toward Civic Center, where thousands gathered for a "Peace, Love & Understanding" rally. The event featured live performances by Michael Franti, Malo, Momma's Boys and more. "San Francisco as a whole, we are a liberal city and this is not a place for hate or any sort of bigotry of any kind," Bianca Harris said. "I think it's a really powerful message that we're sending to people who come here to try to spew messages of hate that it's just not welcome in this city." Under a rainbow flag that flapped in the wind, hundreds gathered at Market and Castro streets to stand up against hatred, racism, fascism and the "alt-right" movement. Earlier in the week, San Francisco Mayor Ed Lee raised concerns that Patriot Prayer would attract hate speech and potential violence. U.S. Rep. Nancy Pelosi, a fellow Democrat who represents San Francisco, called the planned rally a "white supremacist" event. Gibson said his group disavows racism, white nationalism and hatred, and insisted his gathering would have been peaceful. "It wasn't an easy decision," he said about nixing the Crissy Field rally and said that although some people were disappointed in his decision, it was the only way to prevent a "huge riot." When working with the National Park Service on a permit application, Gibson said he initially believed that all rally attendees would be "shipped" into Crissy Field. It wasn't until later that the U.S. Park Police said he would only be able to enter with 50 or so people, who he considered "tight-knit." "Everyone else would have to be stuck outside, 50 yards away, mingling amongst Antifa, communists or whoever … extreme left liberals, and then we would have to get wrist bands and get our people to go through the crowd to find supporters to bring them back in," Gibson said. "The whole point of the rally was to bring in people who wanted to get to know us not to just do a speech to our supporters … At that point, I finally was like it's just not right, it's not going to happen." Neither the National Park Service nor U.S. Park Police have confirmed this information. Gibson said Saturday in a phone interview that he felt like San Francisco's Democratic leaders had shut him down. "They're definitely doing a great job of trying to make sure my message doesn't come out," he said. 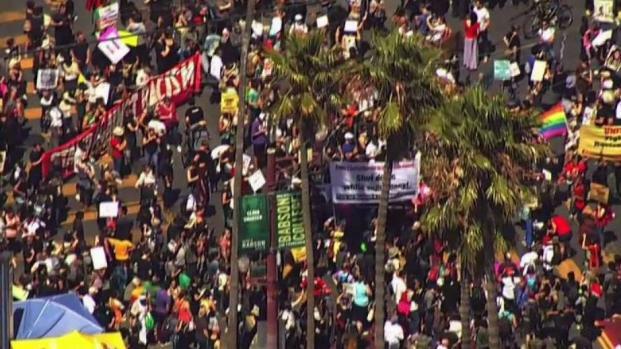 Counter-protesters on Saturday marched to Mission and 24th streets, forcing road closures and bringing traffic to a standstill. Some performed a "lie-in" in the middle of the roadway, amid a heavy San Francisco police presence. On Facebook Live, Gibson encouraged supporters to ask "corrupt career politicians," including Mayor Ed Lee and Sen. Nancy Pelosi, whether they support Antifa. Patriot Prayer is being vilified in the media, he said, but no one is asking questions of the "alt-left." Gibson was joined on Facebook by Kyle "Based Stickman" Chapman, who was arrested during a violent "March 4 Trump" rally in Berkeley in May. "Whether or not there's violence at these events lies in the hands of the mayor, the police chief and the people that are tasked with security," he said. Chapman also accused the media of portraying them "as bigots, white supremacists and Nazis," which has "incited hatred among the locals here in San Francisco against us." He urged others who support their movement to "push back against this narrative" and fight what Chapman deemed is "systemic oppression" on the part of Bay Area politicians. The Bay Area is considered the birthplace of the free speech movement, and police in San Francisco have traditionally given demonstrators a wide berth. 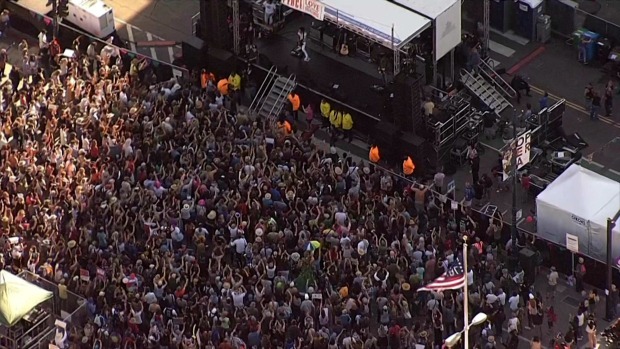 A group of people gathered at Civic Center Plaza in San Francisco for a "Peace, Love & Understanding" rally where they danced to tunes while combatting hate. Organizer Amber Cummings said in a lengthy statement issued via Facebook that she had "grave concerns for the safety of the people attending my event." Cummings said the event was planned "to speak out against the political violence happening to people who do not agree" with left-wing ideology, and that the meaning was being lost as rhetoric around the rally escalated. The left-wing group By Any Means Necessary, which has been involved in violent confrontations, had vowed to shut down the Berkeley rally at Civic Center Park. Asked Saturday whether he had any plans to go to Berkeley, Gibson said he would "analyze the situation." Associated Press writers Janie Har and Haven Daley contributed to this report. NBC Bay Area's Thom Jensen, Christie Smith and Sergio Quintana also contributed to this report.